I'm always on the look out for new things to grow or new varieties. The rhubarb I grow is from my mums garden and she inherited it from the gardener who lived there before her. It's a great type, keeps it's shape well when cooking and isn't too sharp, we've no idea of the variety but I know I'll certainly keep growing it. That said I've always wanted to see how it compares to other types and if there's much difference. I saw this "Raspberry Red Rhubarb" at the weekend and I decided to give it a go, it says it's a newly developed strain that doesn't need forcing (I hardly ever force mine any way) and should be slightly sweeter with thinner stalks. 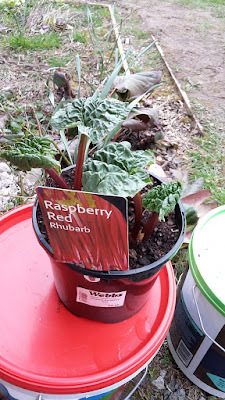 Anyone else have different varieties of rhubarb? What's your favourite variety? The only rhubarb (and I love, love, love rhubarb!) I've ever grown is from a root a friend gave me. He called it "strawberry rhubarb" and it has very red stalks and a wonderful flavor. I've chopped off chunks of it to give to friends over the years, but other than that, it's always grown in the same spot. I never used to care for it, but that was years ago. I really should give it another taste. My grandmother grew rhubarb but it had been around so long that I doubt anybody remembered the variety. I've tried to grow it here, but our summers are just too hot. That's disappointing because I would love to have rhubarb. No idea what my variety is called, but I lifted the cover yesterday to find just 2 big stalks. There are others coming, but usually my forcing pot is filled. Maybe I need some new crowns too. Two varieties that we enjoy are Champagne and Victoria. Rhubarb is not a very common fruit here in central western France and we could only find 'no name' varieties when we moved here. Many years ago we brought two plants back from England and are still enjoying the fruit. They are never forced and we have just finished the first rhubarb crumble of the season. Looks like most people don't know their varieties, us neither, but I love rhubarb!